“The video takes audiences behind-the-scenes and demonstrates our passion for the product,” says Plungy. "Our goal is to help people and we believe this technology will do that." Varian had a top-notch experience with Cision's Multivu team. “In the pre-production process, they helped us refine our overall story beyond the press release, which gave the creative team a solid foundation for their storyboard,” said Plungy. Multivu and Plungy's team worked collaboratively together from start to finish, making it a very hands-on process. “When you work with people who are so passionate about their work, it makes it easy to put in those extra hours,” said Plungy. Leveraging Cision Distribution by PR Newswire, Varian chose a Multichannel News Release (MNR) to announce the Halcyon system. Essentially a microsite that hosts press release copy, multimedia assets and digital marketing features, Varian's MNR is branded with the corporate logo, fonts and colors. It hosts the launch video and provides space to describe Halcyon system features, as well as testimonials from thought leaders across the globe. To tell a broader story, Varian included quotes from leaders across its global organization. “The MNR provided us with a great landing page to host our big reveal,” said Plungy. 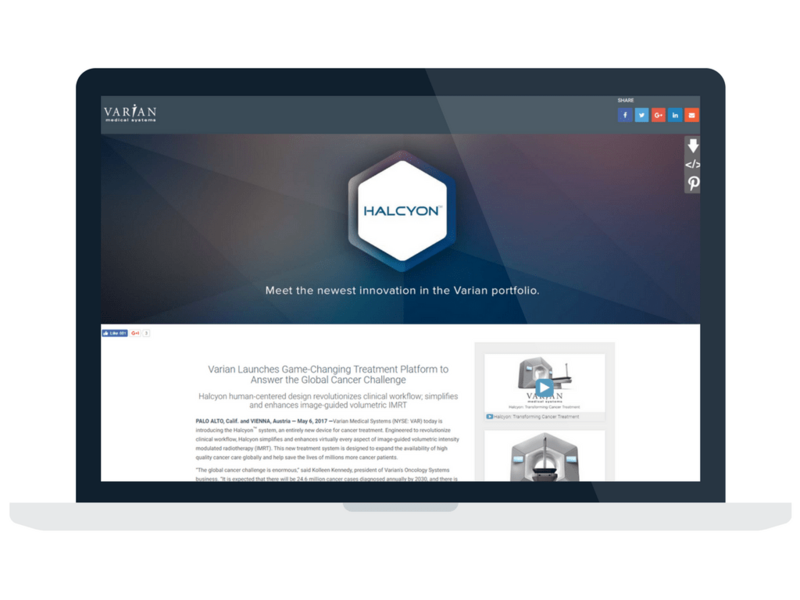 Varian's Halcyon system launch announcement was a massive success with more than 23,000 views to its news release and 46,000+ multimedia views, including 12,000 video views. “The industry's response to the news was outstanding. We even had a couple financial analysts upgrade our stock based on this news, which on its own is just incredible," said Plungy. Employee reaction to the announcement was equally glowing. “Our head of marketing shared it across the entire sales organization because it explained the product so well,” said Plungy. The MNR announcement also generated both earned media opportunities and new leads. “WIRED Magazine contacted us directly for a story,” said Plungy. “I don't know if they would have done that if we had gone with a standard, text-only release.” Plungy's team also had a prospective customer get in touch with them after seeing the announcement on social media. As a result of the campaign, Varian was invited to speak at a medical device design show later in 2017. “We were thrilled to build on the announcement momentum with an opportunity to showcase the story behind the design of the Halcyon system,” said Plungy.